As long as I have been a motorcycle rider, I have always thought that it would be awesome to be able to get some sort of a heads-up display that could project an image onto the visor of my helmet. The display could help track speed, gear, and possibly even provide directions if linked to a GPS unit or smart phone. Other functionality that we can already get with existing helmet communicators should be integrated as well, allowing hands-free calling via a Bluetooth connection to a mobile phone and also music playback. There have been a few solutions that have attempted to accomplish pieces of this, but none that provide a truly integrated experience that is safe and easy to use. Lucky for me, LiveMap and Reevu are two companies looking to change the way we think about helmets. LiveMap is looking to develop a full on augmented reality helmet that will project an image into the field of vision of the rider and display maps, music, and phone data, making it all accessible to the rider even in motion. The helmet will also include integrated speakers and a microphone for total communications integration and will even have a light sensor to automatically adjust the display brightness for the light conditions. The battery will be rechargeable, ensuring that you can always count on the helmet when you need it, and the entire helmet should meet all crash standards in the US, Europe, and Asia. While still a concept, it looks extremely promising and could be among the first true motorcycle head-up display offerings to come to market. Reevu, which is best known for its helmet that has an integrated rear-view mirror (yes, a helmet that literally allows you to see what is going on behind you), is taking a slightly different approach and offering a helmet that has a display integrated into the top of the visor. Their concept sports different colored graphics and should display much of the same type of information as LiveMap's concept. Of course, one big difference between the two is that Reevu's Intelligent Helment concept is only a 3/4 helmet while LiveMap has opted to go with the full-face helmet format. For those of use who ride sportier bikes, the LiveMap will likely be the better option and provide the better protection in the event of a crash. And for those of us who prefer 2-wheeled transportation of the pedal-powered variety, Recon Instruments, maker of the nifty head-up display systems for snowboard goggles, have introduced their first augmented reality sunglasses for endurance sport enthusiasts. With GPS and on-board sensors, the Jet provides a variety of data that is perfect for cyclists and triathletes who want to be able to better monitor their training regimes and also eke out those extra gains through performance monitoring during big events. The Jet is actually available on the market now (for an eye-watering) $600, but is the only product of its kind at the moment. All of these products, whether for motorcyclists or bicyclists, herald a new generation of technology that has the potential to greatly improve the 2-wheeled ownership experience. For a rider like me, the motorcycle helmets are of greatest interest, offering me much more useful functionality, especially when I am off exploring roads that I have never been before. Being able to better anticipate what the road will do because it is visible to me on the map in my helmet would make the experience safer as well as more enjoyable. However, the Recon Jet looks to be a very cool piece of tech. As a more recreational cyclist, I would never be able to justify the cost, but for someone who is way more serious about the sport, it could be a useful tool to add to the arsenal. Of course, the flip side of adding this kind of new tech to sports like motorcycling and cycling is that it is a whole new level of distraction that a rider needs to adapt to. I could see how someone would focus too much on the information displayed on the visor and not enough on the road ahead, leading to a near-miss incident or crash. As long as the companies smartly limit the distraction potential, these are going to be some very cool new products to look forward to in the near future. Read more about LiveMaps' concept here. Visit the LiveMap Indiegogo page to help contribute to making this a reality. 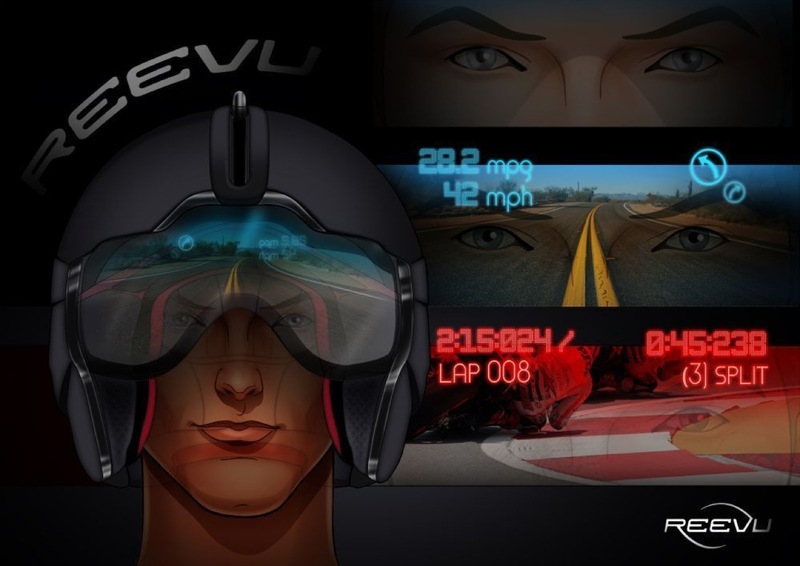 Read more about the Reevu Intelligent Helmet concept here. Learn more about the Recon Jet here.